How do you storage your needles? I usually keep my working needles pinned in a little cushion on my work table and the extra needles I save in empty plastic tubes like this one in the picture. The seed beads I buy normally come in these plastic tubes. 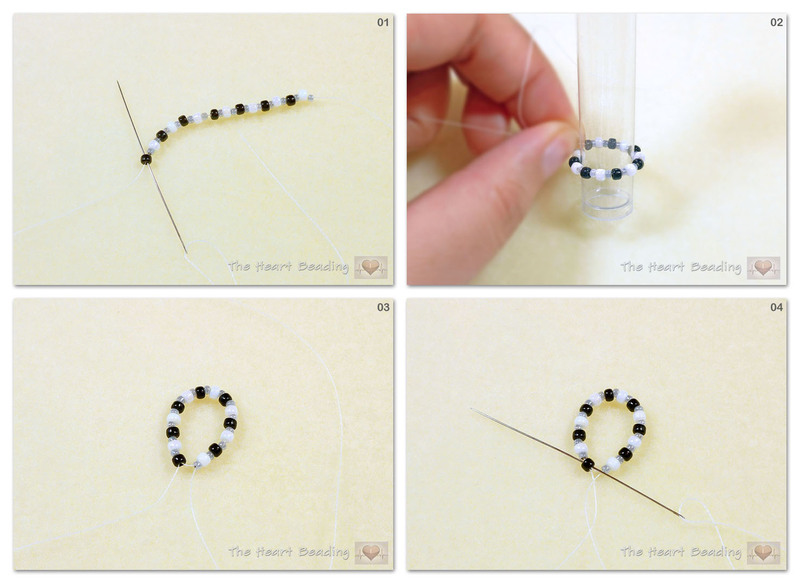 I like to save them when they're empty so I can put my needles, findings and other small beads inside them. 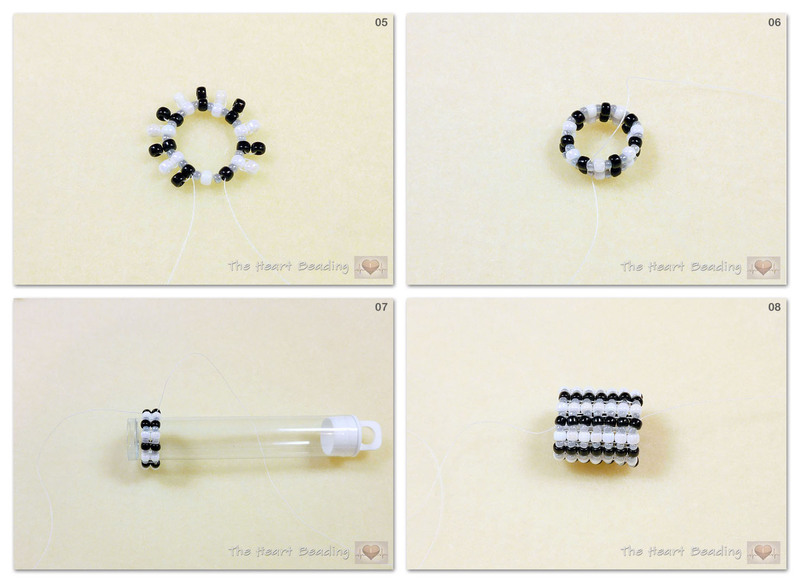 Some time ago I had the idea of embellish a plastic tube with seed beads to create a beautiful needle case. It's very simple but people always ask me how I did it. 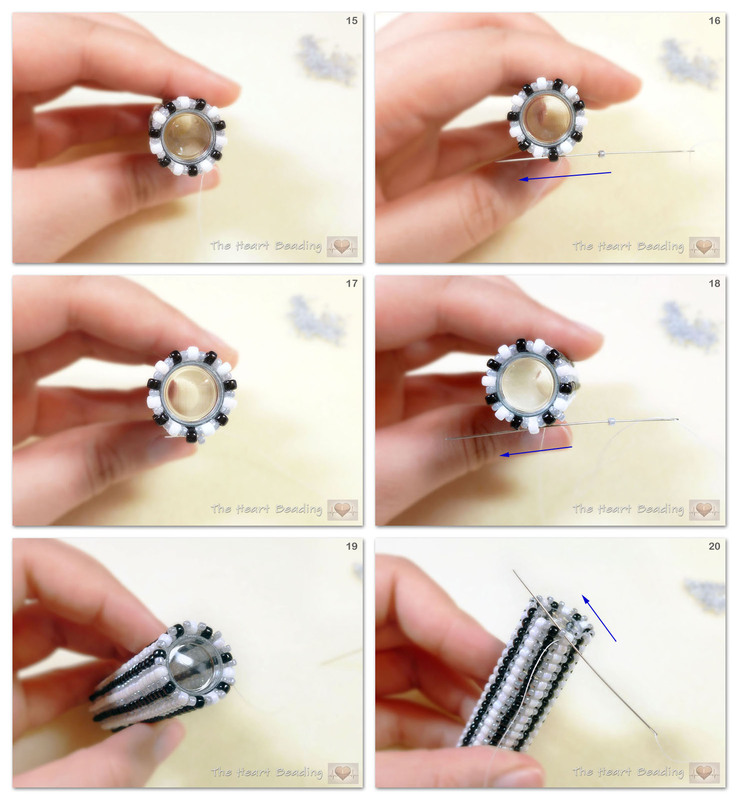 So I decided to make a photo tutorial to show you how to make the needle cases. - A plastic tube long enough to fit your needles. The tubes I used are 3" (7.6cm) long and 0.55"(14mm) diameter. If you have only the very long tubes, you can cut them in the length you want. - If you use nylon thread, I recommend you stretch it before you start working; Use a strong thread - I used C-lon size D.
1-2: String 1 sb8 and 1 sb11 alternately until you have the length necessary to cover around your plastic tube. Leave a 2.5ft or 75cm tail. We'll use the tail to create the bottom of the tube. ATTENTION: It's really important your string fits very tightly around the tube because in this way the finished piece will stay fixed around the plastic tube. We will not use any glue to fix the plastic tube into the cover piece. 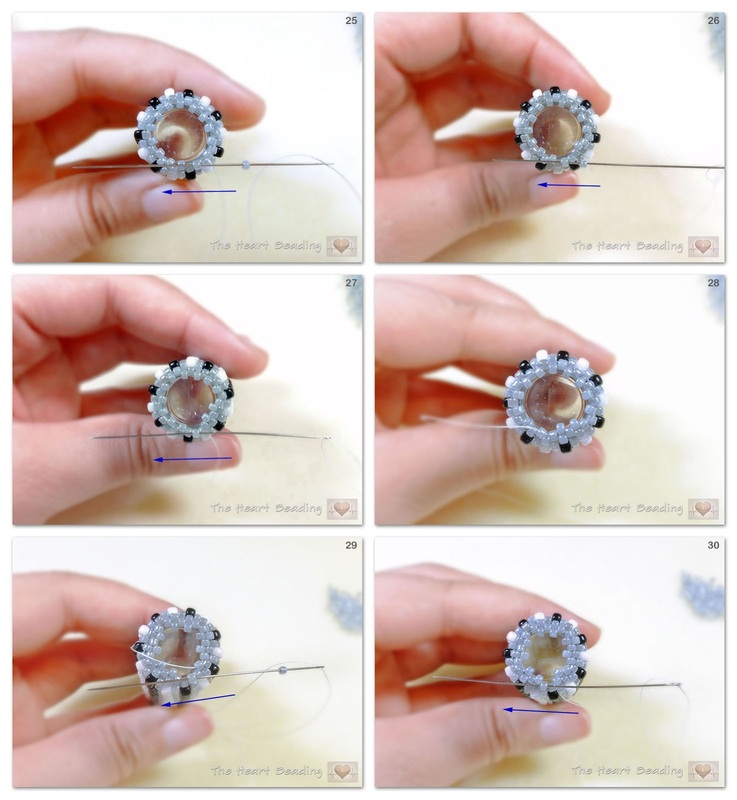 3-4: Pass through all the seed beads again to create a circle and reinforce it. At the end pass through the first sb8. 5-6: Now start working in tubular square stitch. I show how to do this stitch in this video. 7: After finished the second row, you can check again if it fits tightly around the plastic tube. 8: Continue working in tubular square stitch. I recommend you work without the plastic tube inside of it because it will be easier to keep your tension tight. 9-11: When your work is almost the length of the plastic tube, put the plastic tube inside of your work. It'll be a little bit tricky because your work has almost the same diameter of the plastic tube. So be careful while you do it. 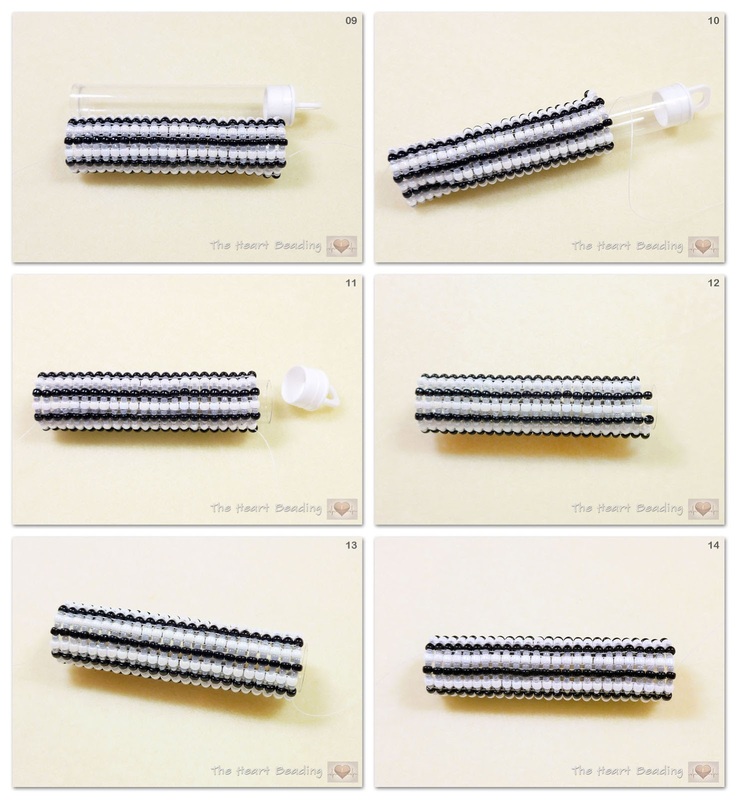 12-14: Now continue working in tubular square stitch until you completely cover the plastic tube. At the end finish your thread and trim it. 15: Thread the tail. Now we'll work in circular peyote to create the bottom. It's important you have in mind that the following sequence of rows is just a guide. Depending on the diameter of the plastic tube you chose, you may work less or more rows. 16-20: Row 1: Exit from a sb8. String 1 sb11 and pass through the next sb8. Work in this way all around. At the end pass through the first sb11 of this row to get ready to the next row. 21-22: Row 2: String 1 sb11 and pass through the next sb11 from the previous row. Work in this way all around. At the end pass through the first sb11 of this row to get ready to the next row. 23-24: Row 3: Work in the same way as the previous row. 25-28: Row 4: Now we'll start the decreasing. I did a decrease every two stitches: (string 1 sb11 and pass through the next sb11 from the previous row) x2, pass through the next sb11 from the previous row without adding any bead. Work in this way all around. 29-30: Because I didn't have an even number of beads, I added 1 sb11 in the bead before the last and I passed through the last sb11 without adding a bead. 31: The row 4 completed. 32: Row 5: String 1 sb11 and pass through the next sb11 from the previous row. Work in this way all around. 33: Row 6: String 1 sb11 and pass through the next sb11 from the previous row; pass through the next sb11 from the previous row without adding any bead. Work in this way all around. 34: Row 7: String 1 sb11 and pass through the next sb11 from the previous row. Work in this way all around. 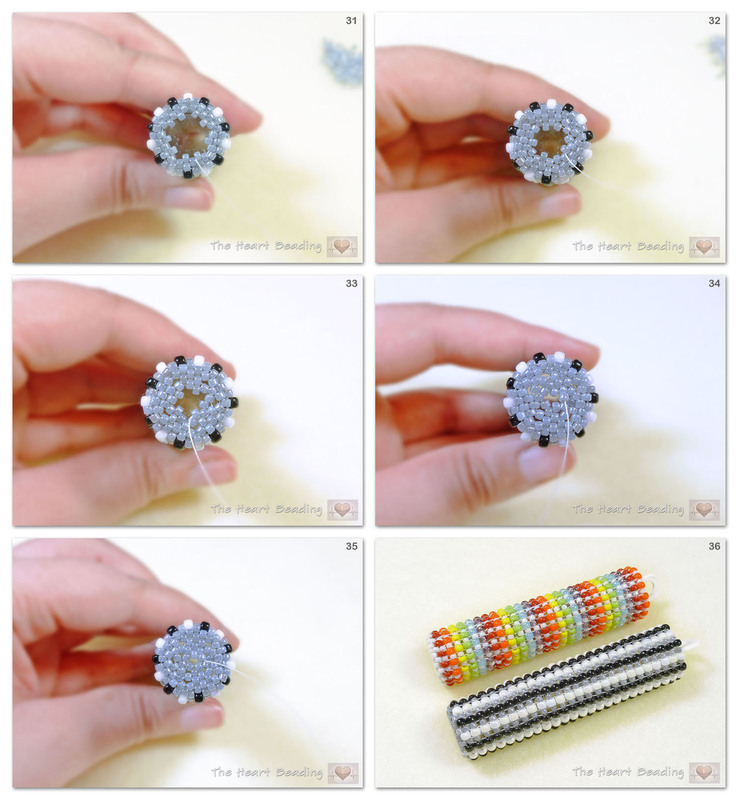 35: Pass through all the beads of the last row without adding any bead. Repeat this step to reinforce. Now finish your thread and trim it. Your beaded needle case is complete!